Eyjafjallajökull is an icecap covered stratovolcano rising to an elevation of 1666 m.a.s.l. The ice covers an area in the summit region about 80 km2 in size. The volcano is situated south of the intersection between the South Iceland Seismic Zone (SISZ) and the Eastern Volcanic Zone (EVZ), close to the southernmost extension of this propagating rift zone. The area is characterized by significant topographic relief and a lower spreading rate than the EVZ. As opposed to tholeiitic products in the axial rift zone further north, volcanic products here belong to the alkaline or transitional suite, and the area is, based on the petrological difference as well as poorly developed extensional fractures, characterized as a volcanic flank zone. The eruptions show a wide range both in eruptive modes and chemical composition, from effusive fissure eruptions producing mildly alkaline magma, to highly explosive eruptions producing evolved alkalic magma, trachyte or trachyandesite. Volcanic activity in Eyjafjallajökull central volcano in the last 1500 years only includes four or possibly five known eruptions, the most recent occurring in 2010. Little is known about Holocene activity, but the basement of the volcano was built up in several glacial and interglacial periods. Three events have been associated with eruptions occurring in the neighboring volcanic system (Katla), which has led to theories of a mechanical coupling between the Katla and Eyjafjallajökull magmatic systems. However, the two neighboring volcanic systems show a remarkable difference in activity level, which may be taken as intrinsic evidence of their difference in temperature structure. The concurrent activity could therefore be interpreted as a clear coincidence. 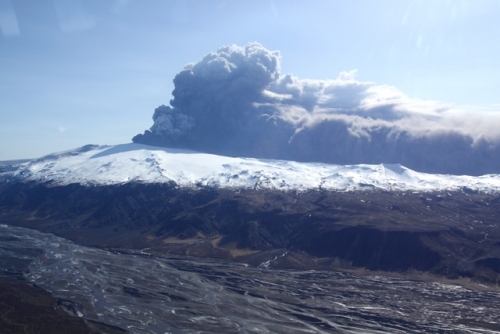 Glacial outbursts (Jökulhlaup) are incident to all eruptions from the summit area of Eyjafjallajökull volcano. Hazards posed by jökulhlaups and lahars are supposed to be large as experienced in the 2010 eruption, mainly because of the steep basement of the volcano and proximity of an inhabited region. Compiled by Rikke Pedersen and Guðrún Sverrisdóttir in March 2012.